Process for purifying one supply gas stream and one secondary feed comprising one gas stream coming from a secondary gas line, by CPSA, comprising at least two adsorbers, each adsorber following, in an offset manner, a pressure cycle comprising a gas production phase and a regeneration phase, a purified gas enriched with the principal constituent being produced at the distribution pressure P1 during the production phase, said process being characterized in that the regeneration phase comprises at least a first countercurrent decompression step and a first elution step followed by a second countercurrent decompression step and a second elution step, making it possible, during the first elution step, to remove, without recompression, a waste gas at a distribution pressure P2, and makes it possible, during the second elution step, to remove, at a distribution pressure P3, where P1 > P2 > P3, a recycle gas recycled into the multifeed gas supply. The present invention relates to a method for purifying at least one feed gas flow and at least one secondary charge comprising at least one gas flow coming from a secondary gas line, by compressor pressure swing adsorption (CPSA) from a multi-charge gas feed. It also relates to a purification unit for implementing this method. In industrial installations, it may prove economically valuable to recover a gas formed as a secondary product in a reaction zone, or more exactly to recover a particular constituent of this gas formed, in order to re-use it in another reaction zone so as to limit rejects and gas losses. However, it is necessary for the recovered gas to be purified and introduced into the reactor at the required pressure. This optimization of the management of gases, and in particular of hydrogen, is in particular very important in refineries or petrochemical complexes that have an increasing deficiency in hydrogen resulting from a lack of equilibrium between the units producing hydrogen and those consuming it. This means that there is an increased requirement for a hydrogen flow, preferably with a high content > 80%, that can be obtained by means of supplementary production or by recovery associated with a purification process. Moreover, the coexistence of several flows containing hydrogen with variable pressures and contents is often noted inside these hydrogen networks of refineries and these petrochemical complexes, the hydrogen content generally falling with pressure. Essentially, these flows are either high pressure flows > 15 bar (HP) rich in hydrogen where they consist of either a reaction product (for example from a catalytic reformer, steam-cracker and steam reformer, in which the pressure is situated around 15-30 bar) , or an unconsumed reactant generally purged from recycling loops (for example: hydrotreatments in which the pressure is situated around 20-40 bar) . These flows may also be low pressure (LP) and have a low content, situated around 3-10 bar pressure and about 30-60% hydrogen content respectively. These LP flows are generally derived from LP purges of hydrotreatment units and are destined for the fuel network of the refinery. However, it is not always judicious to employ hydrogen simply as a fuel when it could be profitably used as a chemical charge in a hydrogenation reaction. In this case, these various flows should thus be able to be recovered, purified and then reintroduced at the required pressure. Within the context of the present invention, the expression "PSA" denotes a Pressure Swing Adsorption system, while the expression "CPSA" denotes "Compressor Pressure Swing Adsorption", the expression "concurrent" denotes the direction of gas circulation in the adsorber during an adsorption phase, the expression "counter-current" denotes the reverse direction of circulation and finally the expression "balancing pressures between adsorbers" denotes a gas transfer between adsorbers so as to balance the pressures existing in these adsorbers. This balancing may either be total so that at the end of balancing the pressure in the two adsorbers put into communication is equal, or partial, so that at the end of balancing the pressure inside the two adsorbers put into communication is different. The terms regeneration and elution will be used equally in the description. The pressure values indicated are absolute pressures unless specifically indicated. Percentages are volume percentages unless specifically indicated. The integrated compressor of a CPSA is the compressor for recycling part of the regeneration gases. "High content" or "low content" is understood to mean the content of a gas as the main constituent, that is to say of the constituent of which the percentage in the said gas to be purified is to be increased. Thus, a low content gas will be a gas containing a low percentage of a main constituent < 60%, and a high content gas will be a gas containing a high percentage of the main constituent > 80%. Currently, different approaches exist for arriving at this dual objective of purifying an HP, high content flow but also of additionally recovering hydrogen from one or more LP flows. The first approach is the purification-recovery of gas flows containing hydrogen by treating a mixture of various gases (after compressing the LP flow to the HP flow pressure) by a membrane permeable to hydrogen. This type of membrane makes it possible to obtain gas flows having a hydrogen content that can rise to 90%, or even 98% with acceptable yields (80 to 98% according to the desired purify) . However, the permeable membrane solution has several disadvantages: an inability to provide a gas having a very high purity hydrogen content, for example above 99.5%, generally required by the more recent hydrotreatment units, or for feeding a fuel cell, the necessity to recompress the permeated gas, more often after its passage through the membrane. Indeed, the purified gas, enriched in hydrogen, is produced at a reduced pressure and the performance of the membrane is much better as the production pressure is low, so that consequently a supplementary suppression step has to be carried out upstream or downstream from the membrane, in order to provide the purified gas, enriched in hydrogen, at the pressure required by the consuming unit, low mechanical and chemical resistance to pollutant condensates present in the fuel gas network of the refinery. A second approach is the use of membranes with inverse selectivity which keep hydrogen under pressure. However, these membranes have low hydrogen/hydrocarbon selectivities (< 10) (particularly for the separation of hydrogen and methane) . Consequently, in order to reach a sufficient hydrogen content (> 98%) , hydrogen losses are such that they are fatal for this type of technology. A third approach of the prior art that is very widespread consists of purifying hydrogen of a mixture by adsorption (PSA) . This adsorption method makes it possible to reach levels of the main constituent content above 99.5% with yields of the order of 85 to 90%. Application of adsorption to a gas mixture containing nitrogen is for example described in US 5,174,796 and the application of adsorption to a gas mixture containing hydrogen is for example described in patent WO2005/009591. The main specificity of this approach is the obligatory use of several compression zones: a first where the LP charge is compressed before it is mixed with the HP charge; a second where the residual gas from the PSA generally at a very low pressure (below 1.5 bar) has to be recompressed to the pressure of the fuel gas network of the refinery or petrochemical complex. Although this approach effectively enables a main flow to be purified in a single treatment unit and hydrogen to be recovered coming from a low content-low pressure network, the multiplication of machines necessary for establishing this configuration brings about a high investment cost that limits the spread of this approach. Moreover, as is well known to a person skilled in the art, the higher the pressure of the flow to be purified and therefore the higher the high pressure/low pressure ratio of the PSA cycle, the greater the number of balancing operations, which increases all the more the number of adsorbers. Another approach of the PSA type, called "separate charge" may be envisaged with no mixing of the HP and LP flows. Nevertheless, this technology does not eliminate the handicaps of the traditional PSA since various successive compression zones exist so that the residual gas is generated at a very low pressure. Resulting from this, a problem that is presented is to provide a purification method, for at least one feed gas flow and at least one secondary charge comprising at least one gas flow coming from a secondary gas line, improved with a high yield enabling on the one hand a residual gas to be released directly at the pressure of the fuel gas network, when this pressure is relatively high, and of which the investment and operating costs are not prohibitive (size and number of adsorbers, compressors, etc . ) . - the feed gas is obtained by catalytic steam reforming, by partial oxidation, by gasifing coal or residues, or by mixed methods; a mixed method being understood to be a combination of steam reforming and partial oxidation. Thus, the purified gas produced according to the method of the invention has a main constituent content greater than 91%, preferably greater than 95%, yet more preferably greater than 99% and in an even more preferred manner, greater than 99.5%. The residual gas has a the main constituent content of the order of 25%, preferably of the order of 20%, and yet more preferably of the order of 15%. The recycling gas has a main constituent content greater than 45%, preferably greater than 55%. The main constituent content of the residual gas and of the recycling gas will of course be in particular a function of the pressure P2 and P3, or more precisely of the ratios P1/P2 and P1/P3, as will be explained below. A balancing operation is carried out in the same cycle so as to balance the two adsorbers in pressure respectively in the decompression step and in the compression step, the upstream adsorber ensuring recompression of the downstream adsorber with a minimum of gas coming from the feed or from the outlet from an adsorption phase, in this way making better use of the pressure. Thus, the present invention makes it possible to solve, in a single treatment unit, the problem of simultaneous treatment of different hydrogen flows with variable pressures and purities, that is to say of treating a gas mixture at a high pressure, for example at a pressure greater than P > 20 bar and a high main constituent content, for example having a content greater than 70%, a gas mixture at a high pressure with a moderate main constituent content, for example having a content greater than 40%, as well as a low pressure gas mixture, for example below 6 bar and with a low main constituent content, for example having a content greater than 25%, within the same pressure swing adsorption cycle. The method according to the invention is completely appropriate in the case where the distribution pressure of the residual P2 is relatively high > 6 bar. Indeed, the residual gas may then be used in a refinery where the pressure of the fuel gas network is high. In addition, the gas released during elution at the lowest pressure P3 (final regeneration pressure) and that contains a main constituent content higher than that of the residual gas, is recycled so as to feed the process once again, in this way increasing the overall purification yield. Thus, contrary to PSA or CPSA methods of the prior art, for which the ratio of adsorption pressure (PADS) /regeneration pressure (PREG) was limiting in terms of hydrogen yield, the method according to the invention, by virtue of repetition of counter-current decompression and elution steps, makes it possible to improve yields without supplementary costs and may then be put into practice for wider ranges of the Pads/Preg ratio, that is to say of the pressure P1/P2. Indeed, in PSA methods, the present inventors have shown that the purification yield in hydrogen as a function of the ratio Pads/Preg (Pads = pressure of the mixture of gas flows entering the production phase and Preg = the lowest regeneration or elution pressure of the adsorption cycle) follows an asymptotic curve (represented by the curve in a semi-continuous line in Figure 4) of which the asymptotes are Pads/Preg = 3.5 and the H2 yield = 91% (value that is a function of the required hydrogen purity) and the optimum balancing number NEQ to be employed is also determined by this Pads/Preg ratio (as shown on the dotted curve of Figure 4) . It follows from this figure 4 that the high recovery yields (> 87%) for poorly adsorbable gases are situated more on the side of low regeneration pressures corresponding to rather higher pressure ratios (Pads/Preg > 12.5) and that a rise in adsorption pressure has a tendency to improve performances of the PSA in order to reach a maximum at a Pads/Preg ratio of 20. Similarly, parallel to this increase in the yield of the PSA, it appears necessary to increase the number of optimum pressure balancing operations NEQ with an increase in the Pads/Preg ratio. It then appears that, overall, the performances of the PSA will be improved if the pressure ratio Pads/Preg is increased at the same time as the number of optimum pressure balancing operations NEQ. Moreover, this figure shows that as regards low pressure ratios, it is not possible to maintain a high recovery yield simply by employing PSA since it is not possible to maintain a sufficient number of optimum pressure balancing operations NEQ (NEQ tending towards zero) . The present inventors have also shown that it was possible to maintain good recovery yields at low Pads/Preg ratios by adding selective recycling of hydrogen coming from a regeneration phase, as the conventional CPSA permits (as shown on the continuous curve in Figure 4) . It is then no longer necessary to have a significant number of pressure balancing operations NEQ in order to have a good hydrogen yield. Thus, according to the invention, the hydrogen yield may still be maintained, in relation to the conventional CPSA, on pressure ratios that are even lower, on account of the fact that the pressure P3 is reduced so as to have, in the second elution plateau, a higher Pads/Preg, that is to say a higher optimized Pads/P3, for optimum recycling of the recovered gas fraction, rich in the main constituent for feeding the adsorption phase. To sum up, it is for these reasons that by lowering the pressure to that of the second regeneration/elution plateau, the invention encourages optimum dimensioning of the assembly while widening the pressure range for which a CPSA may be employed, seeing that it is possible to respond to a demand where (Pads/P2 < 3.3) while maintaining (Pads/P3 > 3.3). Thus, the method according to the invention is particularly advantageous in installations where P1/P2 is close to the threshold value of 3.3 since, contrary to methods of the prior art, it makes it possible to obtain very good hydrogen yields. Moreover, for higher P1/P2 ratios, the invention may prove to be an improvement over the conventional CPSA through its capacity to develop a solution at a higher Pads/Preg ratio and thus, potentially, with a higher hydrogen yield. Thus, as an example, let us consider an application where an HP charge, with a pressure equal to 25 bar (Pl) with a hydrogen content of 80%, has to be purified complementary to an LP charge, with a pressure equal to 5 bar (P2) and with a hydrogen content of 45%. From figure 4, an H2 PSA operating at these pressure levels in adsorption and in regeneration will have its hydrogen yield situated around 67% for this Pads/Preg ratio = 5 and for an optimum balancing number around 0.4 whereas for a conventional CPSA, this hydrogen yield can reach 77% by virtue of the addition of a recycling compressor. If now, within the context of the invention, a second regeneration step is added at a pressure of 3.5 bar (P3) the pressure ratio Pads/Preg becomes equal to 7.1 and the hydrogen yield reaches 87.5%. Finally, if a PSA with H2 is now considered at a low regeneration pressure equal to 1.4 bar (P3) , the associated Pads/Preg ratio would then be 17.8 and the hydrogen yield would be close to the maximum (-89%) but it would be necessary to invest in a supplementary compressor as well as two supplementary adsorbers in order to reach the optimum NEQ of 3. The method according to the invention thus makes it possible to treat, with a single assembly of adsorbents, several gases with different pressures and hydrogen purities with very high hydrogen yields at minimum cost. In the method according to the invention, the recompression phase is carried out on the one hand by successive balancing operations with the decompression phase and on the other hand with purified gas coming from the adsorption step, that is to say by using part of the gas produced during the adsorption step and/or part of the gas coming from a concurrent decompression step. The balancing number is a function of the optimum NEQ and lies between zero and four, preferably between zero and two . The balancing number and the total number of adsorbers are linked. Thus, at each new whole or partial balancing step, an adsorber is added to the total number of adsorbers. The method according to the invention has the following advantages compared with existing solutions: 1) it makes it possible to upgrade several gases containing hydrogen at the outlet from the hydrogenation unit; these gases being generally used as fuels; 2) during purification of a recycled gas, the hydrogen yield in relation to the HP gas to be purified may be 100%, or even largely greater on account of the recovery of hydrogen coming from the secondary charge, and the addition of H2 coming from an external source is then significantly reduced; 3) the method makes it possible to treat a gas mixture with a different composition pressure within the same pressure swing adsorption cycle; 4) it makes it possible to produce a residual gas at the pressure of the fuel gas network, even if this is quite high, that is to say above 5 bar, or even above 7 bar; 5) it makes it possible to reach hydrogen recovery sites where the high pressure of feed networks is relatively low in relation to pressure of the fuel gas network (low P1/P2) . The object of the invention is also a unit for purifying at least one feed gas flow Fl and at least one secondary charge F2 comprising at least one gas flow f coming from a secondary gas line comprising a main constituent and at least one impurity, employing the method according to the invention, comprising at least two adsorbers, said unit being associated with a fuel gas network 9, this unit having a line for producing at least one purified flow enriched in the main constituent leaving the adsorber or adsorbers in the production phase 3, a residual line 4 adapted so as to convey a residual gas leaving the adsorber or adsorbers in the regeneration/elution phase to the fuel gas network, a line 6 for recycling at least one recycling gas leaving the adsorber or adsorbers in the regeneration/elution phase and a compressor for compressing the mixture of recycling gas, possibly with a gas flow coming from a fuel gas network 9. The number of adsorbers may be increased in order to improve the purification yield. However, as it follows from Figure 4, for each Pads/Preg pressure ratio, an optimum number of balancing operations is defined which assists in determining the total number of adsorbers to be installed. It will also be noted that beyond a Pads/Preg pressure ratio, the hydrogen yield cannot be improved even when the number of balancing operations is increased beyond 4 which tends to limit the use of PSA for pressure ratios greater than 25. Figure 3 is a diagram of an operating cycle of compressor pressure swing cycle according to the prior art, Figure 4 is a graph of conventional PSA and CPSA performance as a function of the Pads/Preg ratio. Figure 1 represents a unit 1 for producing a purified gas enriched in the main constituent from a feed gas comprising a main constituent and at least one impurity. In order to facilitate the description, hydrogen will hereinafter be chosen as the main constituent. Thus, a unit 1 is represented in Figure 1 for producing a gas enriched in hydrogen, incorporated for example in a petroleum refinery. The unit 1 is adapted to produce, from the feed gas led through a line 2, a gas enriched in hydrogen via a production line 3, while discharging a flow of residual gas through a discharge line 4 designed to be connected to a fuel gas network, currently incorporated in petroleum refineries. Contrary to the prior art, the unit 1 does not include a compressor on the residual line 4, since the pressure of the residual gas is at a pressure similar to that of the fuel gas network, this being one of the features of the invention as previously explained. The unit 1 includes an apparatus 5 for purification by adsorption, provided with a recycling line 6. The purification apparatus 5 comprises, in this example, six adsorbers Rl to R6, each having an adsorbent material adapted to fix, by adsorption, impurities (i.e. for example hydrocarbons) contained in the feed mixture. Various types of adsorbent material may be envisaged, such as activated carbon, silica gels, alumina and/or molecular sieves. A person skilled in the art will be able, without excessive effort, to choose the adsorbent material and to dimension the adsorbers according to the flows to be treated. The purification apparatus 5 is of the CPSA type. It comprises to this effect pipelines, valves and control means (not shown) , adapted to follow, at each adsorber Rl to R6, a pressure cycle with a period T, that consists of six phase times substantially of the same duration, and of which a first example is shown in Figure 2. Considering that the cycle represented is applied from the instant t = 0 to t = T at the adsorber R6, functioning of the adsorber R5 is deduced therefrom by offsetting in time by T/6, that of the adsorber R4 by offsetting in time by 2T/6 and so on to that of the adsorber Rl is obtained by offsetting in time by 5T/6. By the phase time/adsorber duality, this comes down to considering that, in Figure 2, the adsorber R6 follows the first phase time represented between the instants t = 0 and t = T/6, the adsorber R5 follows the second phase time represented between the instants t = T/6 and t = 2T/6, and so on to the adsorber Rl that follows the sixth phase time represented between the instants t = 5T/6 and t = T.
(towards the bottom of the diagram) , the flow is said to be counter-current in the adsorber. If the arrow directed downwards is situated below the line indicating the pressure of the adsorber, the flow leaves the adsorber through the inlet end of this adsorber and if the arrow directed downwards is situated above the line indicating pressure, the flow enters the adsorber through the outlet end of this adsorber, the inlet and outlet ends being still those of the gas to be treated and of the gas drawn off in production. The inlet end of the adsorbers is their lower end. - from t4 to t = 5T/6, a second elution step during which the adsorbent material is scavenged with an eluting gas so as to desorb virtually all the impurities previously adsorbed and during which the adsorber is eluted in counter-current, while discharging a recycling gas also at the pressure P3; - finally, from t = 5T/6 to t = T, a counter-current recompression step, during which the adsorber is fed by part of the flows coming from the two adsorbers in the adsorption phase. Moreover, from t = 5T/6 to t = t5, the adsorber is also fed by the flow coming from the adsorber at the start of the concurrent decompression step (t = 2T/6 to t = tl), until the pressure of the adsorber reaches the total equilibrium pressure. Thus, during the first counter-current decompression step and the first step of elution to the fuel gas network (t = 3T/6 to t = 4T/6), the line 4 is fed with a residual gas lean in hydrogen, without recompression, and at a pressure P2, which is similar to the pressure of the fuel gas network. In addition, during the second counter-current decompression step and the second elution step (t = 4T/6 to t = 5T/6), the line 6 is fed with recycling gas rich in hydrogen at a pressure P3, which is lower than that of the fuel gas network. The gas of the line 6 is combined with at least one supplementary gas feed f. This supplementary gas feed f may be at the pressure Pl or lower. In the case where the pressure is lower, the two flows are then compressed from the low pressure LP to the high pressure HP of the pressure cycle by the compressor 8 and form the secondary charge F2 of the adsorber in the second treatment step (from T/6 to 2T/6 as described above) . The secondary charge F2 conveyed by the mixture of a gas flow f coming from a secondary gas line and recycling gas coming from the line 6, is leaner in hydrogen than the main feed gas conveyed through the line 2, and these two feed gases form an asymmetry, in terms of hydrogen content, for successively feeding each adsorber in the adsorption phase. This asymmetry makes it possible to reach a higher productivity than that with a PSA apparatus with a single feed flow. Moreover, this gain in productivity is even higher as the recycling gas, coming from the adsorbers of the purification apparatus 5, is selectively rich in hydrogen, and an increase in this asymmetry is achieved by increasing the flow rate of the secondary charge that is leaner in hydrogen. Thus, instead of having, in the case of the prior art, a deterioration in productivity when the quantity of recycling gas coming from the residual gas is increased in order to increase the hydrogen yield of a PSA apparatus, this productivity is seen to be maintained. In other words, a multi-charge feed, as well as recycling part of the regeneration gas, provides operating flexibility to the petrochemical complex. Other features, advantageous objects and characteristics of the invention will be presented on reading the following examples given solely by way of illustration. Since the residual gas of the treatment unit should feed the fuel gas network, this should be at a pressure of 6 bar . - 2/ with a CPSA method of the prior art of which the cycle is shown in figure 3 that mainly differs from figure 2 by the fact that the cycle only has a single counter-current decompression step, that is from t = tl to 4T/7 followed by a single elution step from t = 4T/7 to t2. The entire elution takes place at 6 bar comprising generation of the residual gas and of the recycled gas. - 3/ with a method according to the invention according to the cycle described in figure 2. 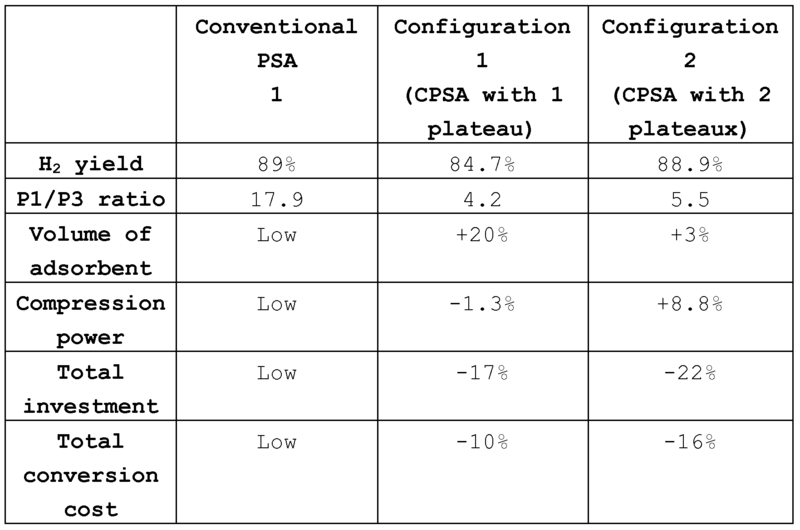 For the same hydrogen yield, the performance obtained by each of the three methods is given as a relative value and gains are presented in table 2 below, the conventional PSA being given as a reference. In the three cases, the residual gas is generated at 6 bar. In the case of the conventional PSA, the residual gas is generated after recompression, which involves a supplementary machine. Table 2 indicates the major benefits of the present invention (configuration 2) by virtue of which the volume of adsorbent and the energy consumption are minimized. These gains on the size of adsorbents bring about a reduction in overall investment and also in the final conversion cost. Finally, gains provided by this novel configuration increase as the pressure of the fuel gas network increases, or even as the pressure ratio P1/P3 falls, as demonstrated in the following example. We shall repeat the conditions of example 1 for a case where the high pressure is 25 bar, which corresponds to lower operating pressure ratios of the pressure swing cycle, and for cycles with optimized yields that are no longer constant. 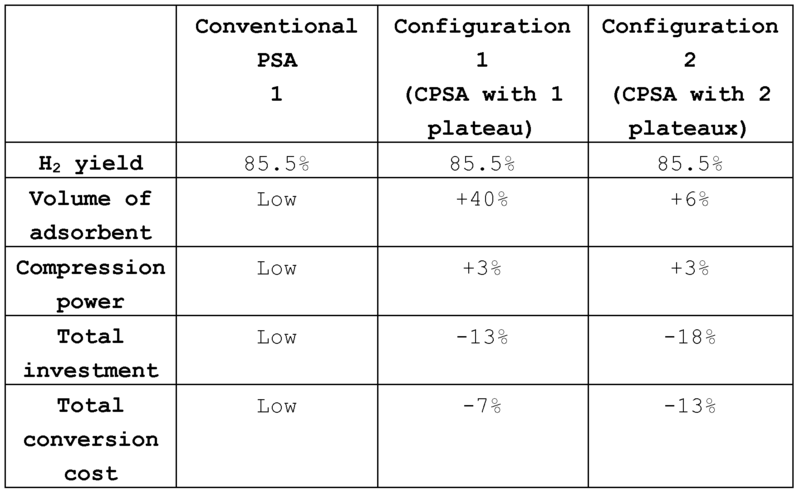 The performance obtained by each of the three methods considered is given as a relative value and gains are presented in Table 3 below, the conventional PSA being given as a reference. In the three cases, the residual gas is still generated at 6 bar. The gains provided by the present invention (configuration 2) are even better for this lower pressure ratio . 1. Process for purifying at least one supply gas stream and at least one secondary feed comprising at least one gas stream coming from a secondary gas line belonging to a combustible gas network (9), preferably a refinery or petrochemical-complex hydrogen network, said streams comprising a principal constituent and at least one impurity, by pressure swing adsorption associated with an integrated compressor (CPSA) starting from a multi-feed gas supply, comprising at least two adsorbers, each adsorber following, in an offset manner, a pressure cycle comprising a gas production phase and a regeneration phase, each phase comprising one or more steps, a purified gas enriched with the principal constituent being produced at the distribution pressure Pl during the production phase, said process being characterized in that the regeneration phase comprises at least a first countercurrent decompression step and a first elution step followed by a second countercurrent decompression step and a second elution step, making it possible, during the first elution step, to remove, without recompression, a waste gas at a distribution pressure P2, which supplies the combustible gas network (9) without recompression and makes it possible, during the second elution step, to remove, at a distribution pressure P3, where Pl > P2 > P3, a recycle gas recycled into the multifeed gas supply, the content of the principal constituent in the recycle gas being greater than the content of the principal constituent in the waste gas. 2. Process according Claim 1, characterized in that the supply gas stream and the secondary feed are of different composition and/or at different pressure. 3. Process according to either of Claims 1 and 2, characterized in that the supply gas stream is at a pressure above 15 bar and the secondary feed is at a pressure below 10 bar. 4. Process according to one of the preceding claims, characterized in that the principal constituent is chosen from the group comprising oxygen, nitrogen, hydrogen, helium, argon and methane. 5. Process according to one of the preceding claims, characterized in that the principal constituent is hydrogen and the impurities are hydrocarbons. 6. Process according to any one of the preceding claims, characterized in that said recycle gas partly supplies the adsorber or adsorbers in production phase. 7. Process according to any one of the preceding claims, characterized in that said recycle gas is combined with the gas stream coming from a secondary gas line before or after said gas is compressed, in order to form the secondary feed and to partly supply the adsorber or adsorbers in production phase. 8. Process according to any one of the preceding claims, characterized in that P1/P2 ratio is between 2.5 and 15 and the P1/P3 ratio is between 3.3 and 20. 9. Process according to any one of the preceding claims, characterized in that the regeneration phase comprises a cocurrent decompression step, a countercurrent decompression step, an elution step and a countercurrent recompression step. 10. Process according to any one of the preceding claims, characterized in that said recompression step is carried out using part of the gas produced during the production phase and/or part of the gas coming from a cocurrent decompression step. 11. Process according to one of the preceding claims, characterized in that the pressure cycle comprises an optimum number of pressure-equalizing steps NPE of between 0 and 2.5, preferably between 0.5 and 1.5. 12. Process according to one of the preceding claims, characterized in that the supply gas is obtained by catalytic steam reforming, by partial oxidation, by gasification of coal or residues, or by hybrid processes. 13. Purification unit for purifying at least one supply gas stream (Fl) and at least one secondary feed (F2) comprising at least one gas stream (f) coming from a secondary gas line, comprising a principal constituent and at least one impurity, which implements the process according to one of Claims 1 to 12, comprising at least two adsorbers, said unit being associated with a combustible gas network (9), which unit comprises a production line (3) , for producing at least one purified stream enriched with the principal constituent output by the adsorber or adsorbers in production phase, a waste line (4), designed to send a waste gas output by the adsorber or adsorbers in regeneration/elution phase to the combustible gas network, a recycling line (6), for recycling at least one recycle gas output by the adsorber or adsorbers in regeneration/elution phase, and a compressor for compressing the mixture of the recycle gas optionally with a gas stream (f) coming from the combustible gas network (9).